“Government, even in its best state, is but a necessary evil; in its worst state, an intolerable one.” Do you know who wrote that? I confess I did not. It was Tom Paine, a statement from Common Sense, his defence of the American rebels of 1776. I’ve only ever read The Rights of Man and have no high opinion of Paine. Still, I agree with his sentiments here, never more so than today, never more so than at this time. There are so many things we take for granted in our lives, people who live in relative security, those of us who are lucky enough to consider personal freedom to be an inalienable right, something bequeathed by past struggles and guaranteed by law. We have reached the ‘end of history’, so the argument advanced by Francis Fukuyama went; liberal democracy is the terminus, the best of all possible worlds. The truth is different; everything is contingent, nothing certain. Europe, it would seem to me, is entering a post-democratic age, developing forms of governance that are becoming increasingly intolerable, increasingly at variance with Anglo-Saxon traditions. America, beset by a crippling debt burden, also faces an uncertain future, with freedoms guaranteed by the Constitution under threat from the growth of state. 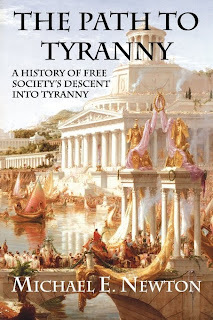 Michael Newton’s The Path to Tyranny: A History of Free Society’s Descent into Tyranny, which, by simple coincidence, I read at just the right time, is a warning, one, in my pessimism, I fear may already be too late. The author is true to his subject, coming like a doctor, or perhaps like a forensic scientist, offering a diagnosis to be worked on or a report to be lamented over; I can’t make up my mind which. While free societies often descend into tyranny because of the choices they make, the people never actually choose tyranny. Instead, demagogues and ideologues promising freedom, equality, and wealth lead them to it. Today, politicians promise the right to high quality education, the right to free and affordable health care and housing, and many more so-called rights. These are not genuine rights. They are benefits at the expense of others. The rights to private property, free speech, and freedom of religion are true tights because they have no cost. The “rights” to education, housing, and health care cost the providers who must supply them for free or at a discount, or they must cost other taxpayers to reimburse the providers. As a result of the government providing these new “rights”, the people have fewer choices as the government rations goods and services, businesses are burdened with more regulation and more bureaucracy is added to the system. Instead of the greater freedom and wealth promised, the people are poorer and become slaves to the government. We then proceed on a journey through various stages and states, from Ancient Greece to Modern America, a journey in political degeneracy, in the systematic erosion of freedom attendant on the rise of the state and forms of demagogic democracy, though the writer himself does not use that expression. I’m thinking specifically of something Aristotle wrote about democracy, that it was the perversion of constitutional government in the interest of the needy. Is that not the perfect leitmotiv for the last hundred years of political evolution in the West? I certainly believe it to be so. Polybius took this up, warning, as Newton reminds us, that giving people too much power invariably ends in tyranny. Oh it’s all very well to talk about the emergence of tyranny in Athens, Rome, Communist Russia, Fascist Italy or Nazi Germany, but the United States, what is the United States doing here? For the simple reason that, like Athens or Rome, it, too, is in the process of transition, with outcomes that remain wholly uncertain. The signs Newton points to are really quite salutary, a growth in state power and intrusiveness that would have horrified the Founding Fathers, a potential tyranny far, far greater than the royal government of George III. The power of the Internal Revenue Service alone should be enough to occasion a dozen Revolutions! The present debt crisis is bound to make things even worse. The Path to Tyranny is a lucid and compelling treatment of an important subject, one that should be of interest to all who value liberty. My criticisms,such as they are, are all of a minor nature. I think the chapter on Ancient Israel should have been placed at the outset, before that on Greece, rather than between Rome and Communist Russia. Also a couple of intermediate chapters would have been useful, including perhaps one on the descent into tyranny of Cromwell’s England, my own period of special interest. 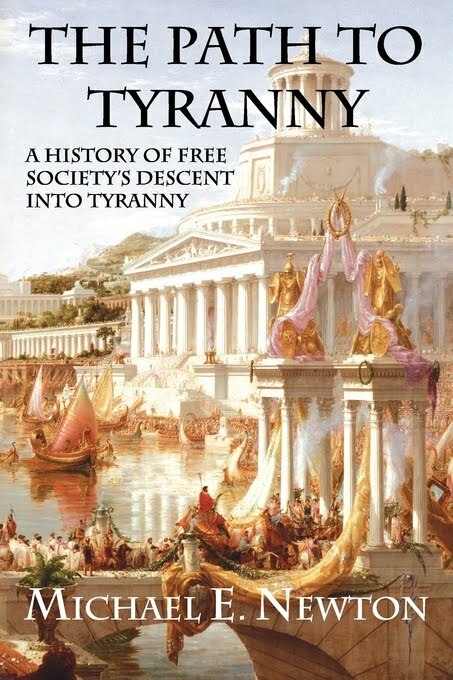 More important a chapter on France after the Revolution of 1789 would have been particularly useful in linking the ancient world with modern tyrannies like Communism and Fascist. Neither Communism nor Fascism can be properly understood, I feel, free from the forms of totalitarian democracy that emerged during this period. There are also a few minor errors of fact, of no great moment, I have to say. None of this should detract from an important book that really does speak to the times, a book that holds up a Janus-like mirror to the present, showing past futures. Sounds useful. I wonder how it compares to this classic? We are so fortunate to live in an age where works of such intellect and scholarship are so easily available for pennies. Calvin, yes, very useful. Hayek; now that's my Bible! Have you read The Law by Frédéric Bastiat? If not it's a brilliant little squib. People need to wake up and change the communist goverments. Have you been peeking in my library? We must be Free or Die…Really?